I remember not wanting to make my 40 week appointment, I was afraid it would jinx me and I was convinced based on the women in my family and their previous first babies that I was destined to go at least 2 weeks early. As the weeks went by, I had to finally put that 40 week appointment on my calendar, circled in red. Up until this point I hadn’t gotten checked to see if I was dilated or effaced. I knew these numbers could stay the same for weeks, so I opted to not know so I wouldn’t stress out if I “wasn’t progressing each week”. Going into the last weeks of pregnancy I had no idea how this baby was moving along and what their exit plan was – it was their show and I was along for the ride. So there I was, sitting in the same waiting room that I had been going to weekly and monthly for the past 40 weeks. Sitting in the same chair, reading the same magazine that was there 4 weeks ago, except this time I had a sense of urgency – I was ready for this baby and anxious about what my pediatrician would say. Since this was my first baby, I had no idea what a true contraction felt like or what it meant to have your water break. I was a big ball of questions and anticipation. I remember every night (for probably 2 weeks) I went to bed thinking maybe tonight. My first official internal check was at this 40 week appointment and I was a whopping 0 cm dilated and 90% effaced, not the numbers I was hoping for but I had to work with what I was given. Because I was at 40 weeks my pediatrician wanted to do a non-stress test to ensure Lottie was doing OK in there, so they hooked me up and started counting her movements. The first round didn’t give us the numbers my doctor wanted to see, so we tried again. They kept coming in and giving it more time, poking around a little with the wand hoping it would get her attention. The third time I drank a juice box to wake her up and get her wiggling, but she still wasn’t moving like they wanted her to. At this point I would be lying if I didn’t tell you I was nervous. When I’m at home she doesn’t stop moving, so why now when I’m hooked up and monitored is she getting shy? She didn’t pass the wiggle non-stress test. With the first test a bust, my doctor ordered an ultrasound where they were looking for 4 specific movements, heart beat… and 3 more things. Honestly I don’t remember a lot of what they were looking for, I just remember laying in the dark room with the technician in silent tears as I pleaded with my baby to show the tech what she wanted to see. 30 minutes. We waited the max time of 30 minutes to see these movements. I was in my head for that 30 minutes staring at the screen holding Josh’s hand, and the technician not saying a word. Josh and I had no idea what we were looking at, but we knew all Lottie had to do was one small movement and we would be on our way. We didn’t get that movement. So we were left with a big F on the non stress test… and maybe a B- on the ultrasound… which averaged to a failing score. My doctor laid out the options, knowing I wanted to try to have this baby naturally (well, as natural as possible). She said she didn’t feel comfortable with me going home, but I could if I wanted to. She was right in saying that if I did go home I would be constantly worrying if everything was OK and I would have to come back in 24 – 48 hours at the latest for another stress test. (Her recommendation) I don’t leave the hospital and they give me cytotec to help “ripen my cervix” and kickstart my body into labor on its own. This medication is used to prevent stomach ulcers while you take NSAIDs (e.g., aspirin, ibuprofen, naproxen), especially if you are at risk for developing ulcers or have a history of ulcers. Misoprostol helps to decrease your risk of serious ulcer complications such as bleeding. This medication protects your stomach lining by lowering the amount of acid that comes in contact with it. This medication is also used in combination with another drug (mifepristone) to end a pregnancy (abortion). I started freaking out. I knew we weren’t combining it with any other drugs, and I honestly did trust my doctor completely, but when you are going into labor and your doctor is suggesting to insert something that was also used to end pregnancies…. I started bawling… Like ugly crying in front of my doctor, the nurse… really the entire office could probably hear me. Suddenly a day that I had dreamt about and pictured and prepared for in my mind for months was quickly getting out of my control. Hours ago I was so ready to have this baby, and now it was all I could do to plead for one more day… a few more hours. Needless to say I was scared. I was checked into the hospital and moments later was getting my first dose of Cytotec along with ordering a hearty meal – I was fueling for the long haul. Cytotec came in four doses, one pill inserted every 4 hours. So after the first dose and four hours they checked me… no change (0 cm dilated and 90% effaced still). They inserted the second dose. Four hours later. No change. They inserted the third dose 4 hours later. Before I go on with more of the story I was feeling great during these… now 8 hours. Our family came and visited me for a while, I was ordering delicious food from the cafeteria (no, really the food at IU North is delicious, their chef used to be John Travolta’s personal chef). I took a few walks around the floor trying to move things along, took a shower to clean up (I of course wanted to look my best if this was the day I was having a baby). The nurses continually asked me how I was feeling, and not being in labor or knowing what to expect I insisted I was still feeling good. They work with women in active labor all day, they could look at me and tell I was not in labor. 3 rounds of cytotec and 12 hours later I was still not dialated and stuck at 90% effaced. 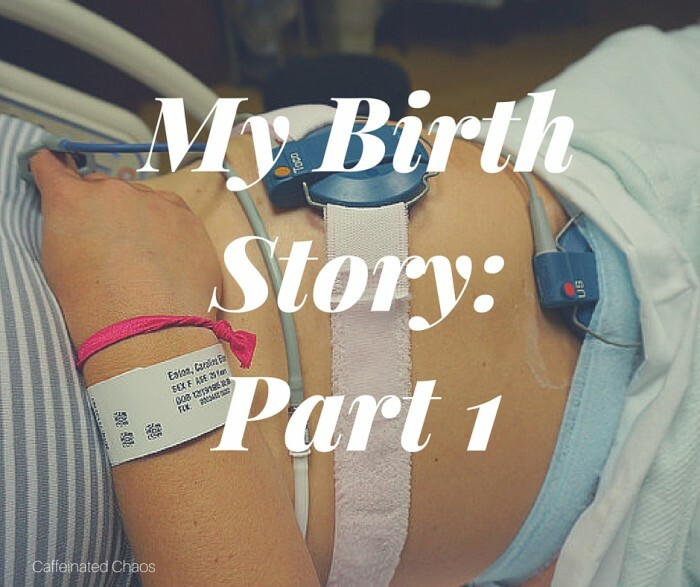 The next thing that happened I felt was key to my entire birth story. My doctor came in and said maybe baby isn’t ready to come after all and gave me more choices. She knew I was trying for a natural (ish) and I didn’t want to force the baby out. This is where I think a great doctor is important. She could have very easily moved to the next steps, to help baby move along, but she opted to not force baby out and gave me options. At this point I’ve had no pitocin or drugs, only the cytotec. We can continue with the 4th dose of cytotec, but she made it clear if we did I was having this baby tonight. Meaning she would go ahead and move forward with inducing me. I could pack up, go home and return in a day or two for another non stress test. She mentioned that sometimes when women are at home in their natural environment their bodies relax and kickstart on their own. After spending 12 hours in the hospital I finally felt ready to have my baby, and I didn’t want to push things along if they weren’t ready. So after spending all day in the hospital, from 8 am until midnight, we packed up and headed home on June 10th. We were exhausted and couldn’t wait to get back to our own bed for a good night’s sleep. Josh climbed right into bed and was in a deep sleep within minutes. I on the other hand needed to shower, my belly was full of goopy gunk from the monitors so I jumped into a warm shower before I went to bed. Of course minutes into my shower I started feeling strong contractions. (I hadn’t felt any up until this point.) I tried climbing in bed, but the contractions only got closer together and stronger, sleep wasn’t in my near future. Instead of waking Josh up right away I went into the living room and labored by myself, really trying to sleep but I wasn’t able to find a comfortable position to sit in…and the contractions kept coming closer together. I maneuvered my 40 week belly into all different positions on the couch, in the chair on the floor, standing, there was no hope – everything hurt.